The Fed’s Normalization: How Long and How Far? The size (total assets) grew enormously from $842 B to $4,478 B. 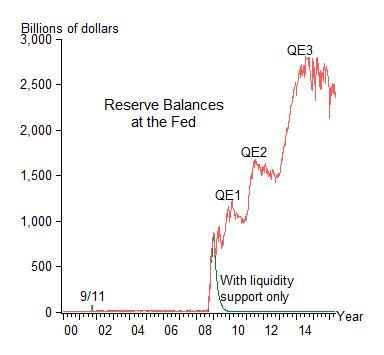 Securities jumped from $760 B to $4,234 B due to “quantitative easing”. 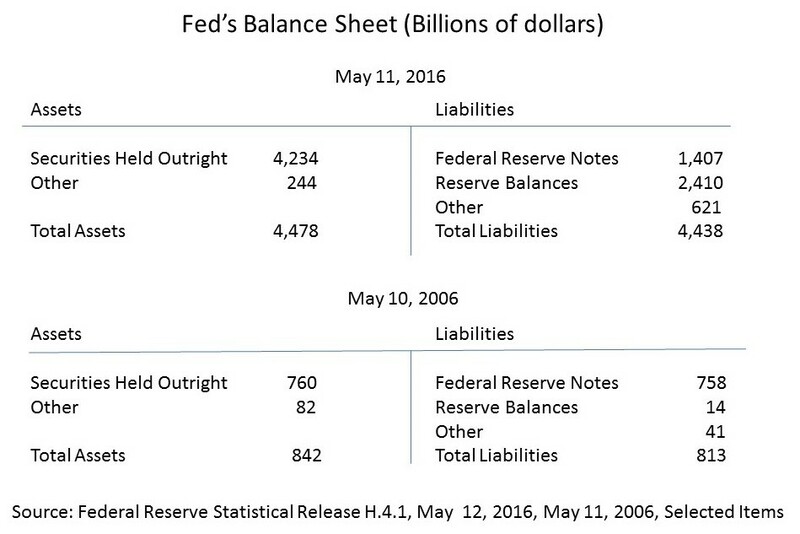 Reserves exploded from $14 B to $2,410 B as the Fed payed for securities by crediting banks with deposits on itself. The chart shows the details of the jump in reserves at the times of QE1, QE2, and QE3. Clearly the large amount of reserves is a legacy of quantitative easing. This big jump in the supply of reserves with no rise in demand would be expected to cause the interest rate to fall to zero. So to raise the interest rate above zero the Fed has to pay interest rate on reserves (IOR) near its interest rate target. Thus when the Fed raised the interest rate target in December by .25 percentage points, it raised IOR by .25 percentage points. Thus with the current bloated balance sheet, the interest rate is not market determined by supply & demand. Rather it is administered by the Fed. This disconnect between the interest rate and reserves is unavoidable with balance sheet so large, but as a normal policy, the disconnect is a mistake. It enables the Fed to be a multi-purpose discretionary institution—allowing its balance sheet to remain large and available for many purposes, including credit allocation—rather than a limited-purpose rules-based institution. This detracts from good monetary policy. If Congress wants these other things, such as credit allocation, it should assign another agency. Given these problems, it is promising that the Fed says in its “Policy Normalization Principles and Plans” that it “will, in the longer run, hold no more securities than necessary to implement monetary policy efficiently and effectively, and that it will hold primarily Treasury securities….” But more specificity about the meaning of “efficiently”, “effectively” and “primarily” is clearly warranted. In my view, a statement that in the longer run the Fed will pay interest only on required reserves and that the federal funds rate will be determined by the supply and demand for reserves would help clarify the nature of monetary policy in the normal state following the normalization period.